I was inspired to create this app after volunteering with Heal the Bay, a non-profit dedicated to advocating for protective environmental legislation and preserving California coastlines through activities like beach cleanups. Through the volunteer beach cleanups, Heal the Bay collects information on the waste and reports the information to the Marine Debris Database (MDDB). As my team picked up waste at the beach cleanup, we tallied each item with pen and paper. After collecting over 1,000 pieces of trash, it became difficult to manually keep track of the items. This method of data collection allows for errors and inefficiencies, simultaneously creating more paper waste. Designed with a simple tapping interface to track the progress of data collection, you can toggle between the home tally screen and to see the amount of debris you've collected. 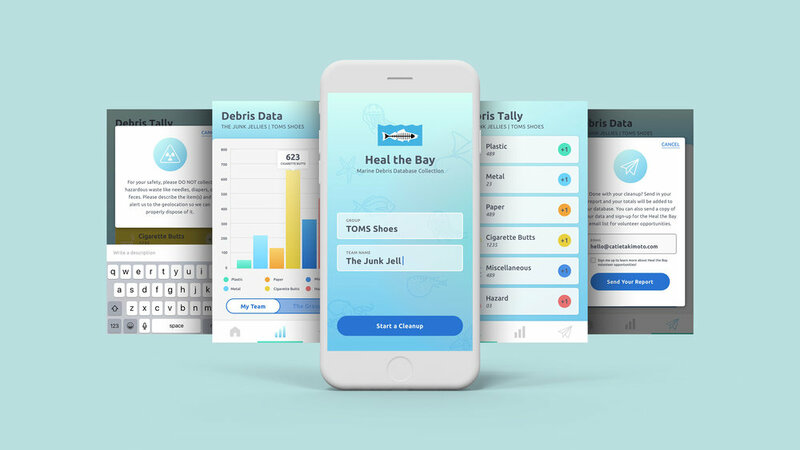 If developed, this app would allow waste to be quickly counted and categorized and then directly upload the numbers to Heal the Bay's Marine Debris Database, eliminating the need for human data entry. See the inspiration behind the app.